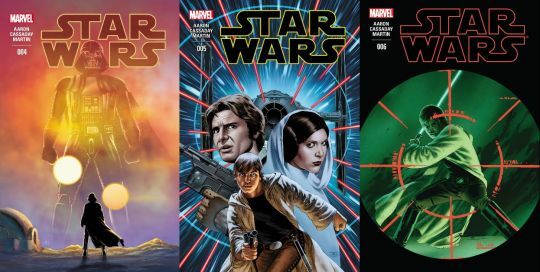 If the first three issues of Marvel’s Star Wars were intended to simply introduce our characters, the next three push our main heroes, Luke, Han, and Leia, off onto paths which come to define them in the following films of the Original Trilogy. 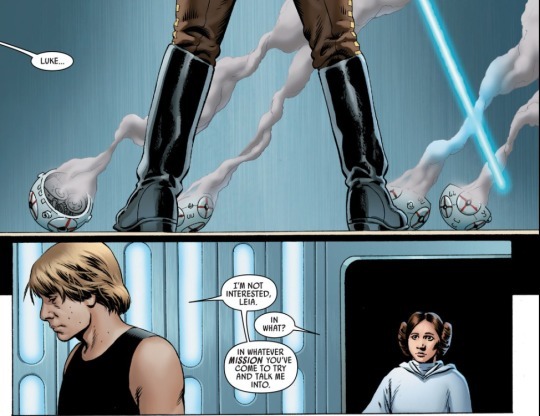 Luke continues his path to becoming a Jedi, while the building blocks of the relationship between Han and Leia start to slowly move into place. The three issues also introduce a dynamic and new character, Sana Starros. Issue Four begins amidst the rebel fleet, the force homeless after the loss of their base on Yavin following the victory against the Death Star. Despite the incredible success of destroying one of the Galactic Empire’s largest weapon manufacturing plants in the galaxy, the leadership of the rebellion is more concerned about logistics than they are about continual strikes against an Empire that’s still reeling from repeated bad news. Despite Leia’s request for more action, the best Mon Mothma, Admiral Ackbar, and others are willing to consider are attacks conducted entirely by Leia’s small team. However, if Leia can find a new home for the rebellion, it might free up some resources. This new mission in mind, Leia hunts down Luke, who is in the middle of experiencing a bit of an existential Jedi crisis, following his narrow escape from Darth Vader. Keenly aware of his shortcomings as a Jedi to be, he turns down Leia’s request for help and instead, tells her he has to essentially go find a way to improve himself before he can be of any help. Reluctantly, Leia doesn’t fight him, and equally as reluctant, she calls upon Han Solo to serve as a copilot in her planned mission. The interaction between Han and Leia is decidedly built upon their interactions for much of The Empire Strikes Back. Han is contending with a Millennium Falcon that’s in need of repairs and Leia is contending with a Solo who is equal parts flattery and frustration. Ultimately, Han agrees to help Leia in exchange for parts for the Falcon, or more accurately, Leia blackmails Han over the parts. In a stolen imperial shuttle, the pair set off into the Outer Rim systems to find a new home for the Rebel Alliance. In an X-wing, Luke sets off for a past home, Tatooine, hoping to find something among Obi-Wan Kenobi’s possessions that might help him down his path to becoming a Jedi. Tatooine has not been quiet, either, since Luke’s last departure. Still on the desert planet is the Sith Lord, Vader, who now officially visits the crime boss Jabba, after his unofficial visit a few days earlier. The blow the rebels struck against the Empire’s logistics have forced it to turn to organized crime to make up the deficit in materials needed to keep the Imperial war machine operating on a normal status. Similarly to Leia essentially telling Han what he’s going to do, the Hutt finds himself with the same bargaining power as Lando Calrissian in Empire; it’s what Vader decides is appropriate and not much else. 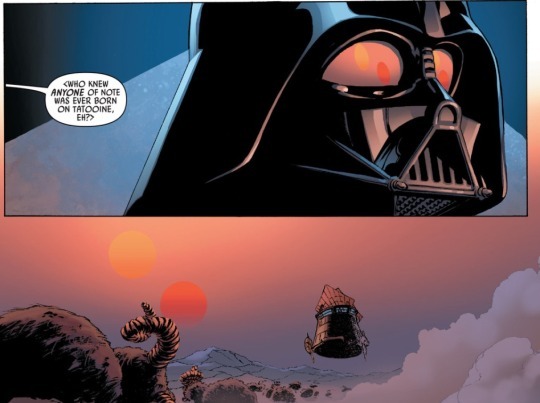 Vader’s time on Tatooine, one expanded by surprisingly agreeing to take a trip on Jabba’s sand barge to watch the slaughter of bantha, is significant given Anakin’s own past. One of the cleverest panels concerning this sojourn depicts the setting twin suns reflected in his masks’ pitch black eyes, all the while Jabba comments how no one of importance could ever come from the sandy wastelands. While Darth Vader leaves to return to his star destroyer, a man in his employee remains, asking questions. Boba Fett is shown carrying out the job Vader hired him to do in Issue 3, and he does so ruthlessly, torturing and killing any and all who find themselves crossing his path. His search for the person who destroyed the Death Star takes a helpful turn in the Mos Eisley cantina of cinematic fame, where he runs across another bored farm boy who used to hang out with Luke and the rest of his friends at Tosche Station. Who this character was, we will never know, but he slipped in a nice nod to Luke’s backstory that was only really presented in the novelization of A New Hope, which was Luke’s nickname, “Wormie.” Satisfied with the information, Fett sets off for the home of Obi-Wan. Fett was not the only one asking questions around Mos Eisley, either. 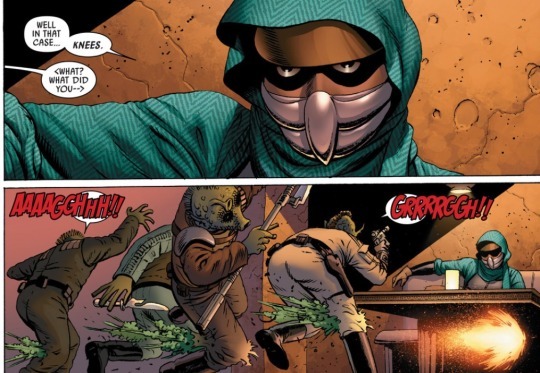 A mysterious masked individual is introduced asking questions, not about Skywalker, but about our favorite smuggler, Han. An unlucky gang of rodians, associates of Greedo, find themselves at the person’s mercy when she uses an computerized gun to place holes in their knees. Their lives are spared only when they report that Han had left the city some time ago. The same rodians later fall prey to the business-like Fett, while the masked slayer of rodian knees departs in a continual hunt for Solo. Luke’s hunt for answers brings him back to Kenobi’s home, and after scaring off Tusken Raiders preparing to raid the squat dwelling, he discovers a box with “For Luke,” written across it. Before he can find out what’s instore for him, Luke finds out the hard way how the Star Wars equivalent of a flash bang grenade robs him of his sight. Courtesy Boba Fett, by every account, Skywalker should have ended up Fett’s prisoner to hand over to Vader. Instead, the two fall into a brief fight, Luke wielding his lightsaber and Fett wielding his complete disbelief that Skywalker is able to put up much of a fight at all. 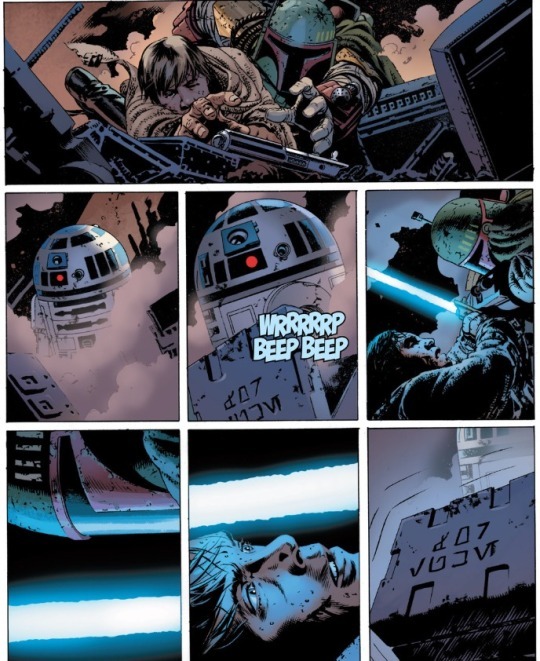 The fight is at times a bit far fetched given how brutal and efficient Fett was depicted in previous panels, and at other times, realistic, such as when Fett decides to start wounding Luke as a matter of convenience. In the end, Fett is knocked over the head with a box swung by R2-D2. Inside the box is a journal which belonged to Kenobi and with it in hand, Luke stumbles away from Obi-Wan’s former home and an unconscious bounty hunter. Elsewhere, Han and Leia’s mission goes south when Han fails to have faith in stolen Imperial codes and the pair find themselves seeking safety from pursuit by TIE fighters on a planet covered in electrical storms. A former smuggling hiding spot of Han’s, the planet hosts a surprisingly beautiful terrain kept secret by the storms above. This sense of security is shattered when the masked individual from earlier, alerted by a beacon set in orbit, arrives to ruin Han’s attempt to share a bottle of Corellian wine. 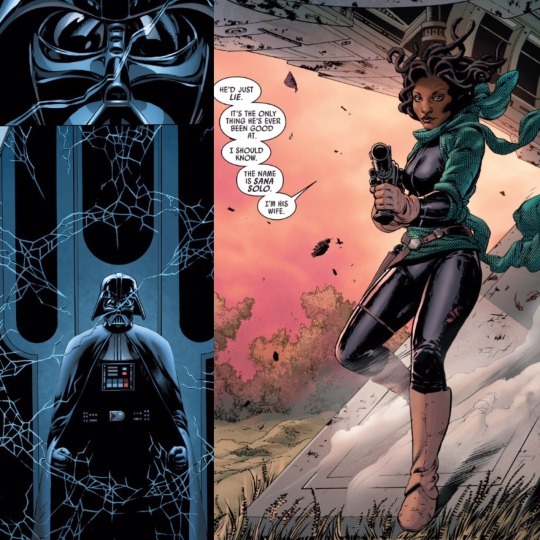 When the gangplank of the ship lowers, we are introduced to one of the best new characters of the Star Wars Expanded Universe, Sana Starros, or as she introduces herself to Leia’s aptly drawn expression of shock, “Sana Solo,” the wife of Han Solo. Sana Solo isn’t the only name that comes with a surprise built in, as Fett reports back to Darth Vader, aboard his star destroyer, that he had failed to haul in his bounty. He did, however, have a name: Skywalker. Vader’s surprise and anger at hearing the name is beautifully illustrated by the glass between him and the void of space becoming covered in spidery cracks from the rage induced Force affecting his surroundings. The name Skywalker will push Vader forward into a path of discovery and confirmation under the Darth Vader title, while Luke’s discovery of Obi-Wan Kenobi’s journal will also provide us with several one off adventures of the Jedi Knight after he made a home in exile on Tatooine to safeguard the only son of Anakin Skywalker and Padme Amidala. In all, the three issues, four through six, balance perfectly the task of setting up new story arcs while entertaining us with new stories and new characters.